Checkout-aisle stalwart and Bart Simpson-approved candy bar Butterfinger would like to reintroduce itself. Butterfinger today announces a new package and new recipe, which it will debut to America via TV commercials and digital ads. 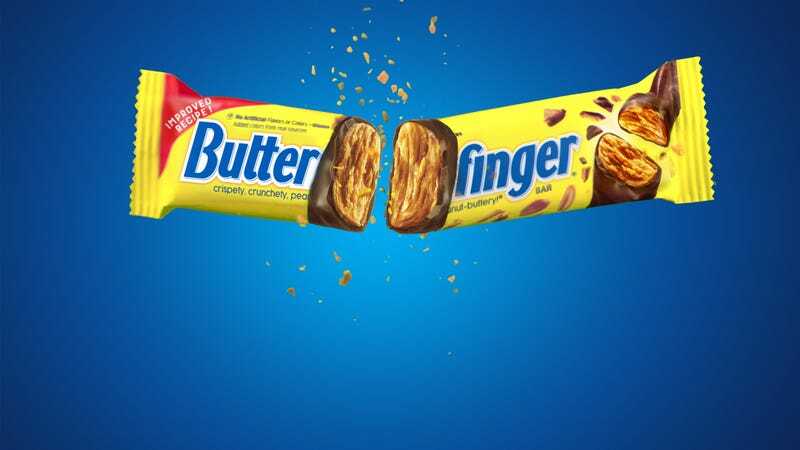 According to a press release, the new Butterfinger has more of the main ingredient: “more crispety, crunchety, peanut buttery goodness.” Butterfinger is owned by Ferrero, the candy company that also makes Ferrero Rocher, Nutella, Tic Tac, and Kinder Joy. We look forward to trying this, and will reserve judgment until we do, but the question remains: Who asked for a new Butterfinger formulation? Remember what happened with New Coke? Which leads to another point about fixing what ain’t broke: When it comes to freshness, has anyone ever bit into a stale Butterfinger? I can’t say I have, because I always assumed the flaky, near-chalky peanut-butter filling was its signature. Is there such a thing as a fresh-tasting Butterfinger? Maybe the new candy bar offers a chance to find out.